Now I have a better idea what we missed. Stewart Goodyear was in the news recently when the Toronto Symphony hired him to replace the scheduled pianist at the last minute: until he withdrew due to online harassment. On social media we heard about a wonderful rehearsal that never came to fruition with an actual performance for an audience, of Rachmaninov’s 2nd Piano Concerto. 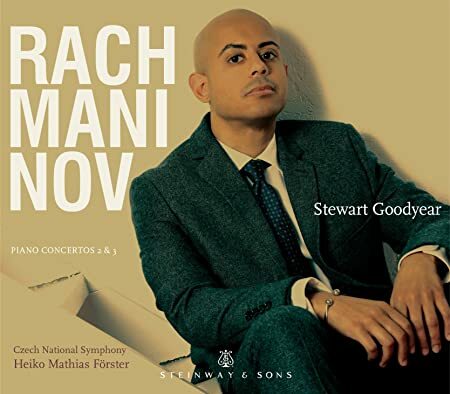 The timing was almost perfect when his new recording was released earlier this year: Goodyear playing the 2nd & 3rd Rachmaninov piano concerti with the Czech National Symphony. I can imagine his frustration, that what seemed like a godsend—and a wonderful opportunity to promote his brand-new CD –should fall through. Yet they do say that there is no such thing as bad publicity. My CD order from Amazon took a long time, possibly because people have been ordering large numbers of the record. It did eventually turn up, and since then I have been listening to those two concerti a great deal in my car. This is not the first time Stewart Goodyear has left me perplexed. I should explain a bit. And the third movement of the concerto was for a time the most famous of all, more than half a century ago: “Full Moon and Empty Arms”. There are great tunes in the Third Concerto too, but for whatever reason the piece has been left more or less un-plundered. After the preamble I should get back to Goodyear and his new CD. Classical music is full of performers who, when challenged by a score from Beethoven or Rachmaninov, play the music exactly the way everyone else does. Now of course a musician doing the usual thing? That is not going to confuse anyone, although he or she may put a few people to sleep. But Stewart Goodyear has a habit of being different if not completely unexpected. The only thing that is predictable is that his playing will be unique. I first encountered Goodyear via his Beethoven Marathon, a fascinating exercise that I understood originally as a kind of athletic feat (playing all 32 of the sonatas in a single day) not realizing how good the performances would be, how good they could be. Imagine performing a one-man version of four or five Shakespeare plays entirely from memory, and you begin to get some idea, except that playing Beethoven on the piano is that much more difficult. I did not expect that in the process of discovering this talented young virtuoso, that he would replace all the other Beethoven interpreters I admired, to become absolutely #1. There were youtube performances of the first and last movements of the Hammerklavier Sonata, Op 106, the fugue finale played so quickly and adroitly that I had to completely change my understanding of the piece. By now i have youtubed my readership with Goodyear’s reading of that fugue that i should almost have the url in my head. There is also a live youtube video that I have shared a couple of times showing Goodyear playing the Appasionata finale faster than anyone I have ever encountered, note perfect on an upright piano. A full set of all 32 sonatas was released with a remarkable set of accompanying liner notes from the pianist suggesting that his penetrating understanding of the music goes far beyond just playing: which is itself a significant achievement. Goodyear has also recorded the Diabelli variations. And I read somewhere online that as a kind of sequel to his Beethoven marathon, he has a gig to play all five Beethoven piano concerti in a single mammoth concert in the autumn..! if i can get there i want to hear this. Listening to Goodyear’s Rachmaninov has me –again—revising my expectations. I am reminded of a comment from U of T music professor Olnick long ago, reflecting on the musicianship of players long ago vs now. He observed somewhat romantically that when we heard the quick violin runs in the Ride of the Valkyries, Wagner would have expected the ragged scraggly hair of a wild horse, not the pristine perfection we now sometimes encounter from a modern orchestra in a digital recording. A century of improving musicianship has come between us and how those pieces likely sounded in the 19th century. These concerti, too, are usually played as a flurry of notes, mostly correct with the occasional fluff, the occasional misplaced note, as though the pianist in collaboration with the orchestra were creating a chiaroscuro in a painting, shading light and dark, cleanness and some dirt too. Usually that is. But Goodyear is of the 21st Century, playing with such athletic clarity as to bring Rachmaninov into focus in a way I have not heard before. While I wonder if Rachmaninov himself would have played this clearly, it does not really matter. This is an account of the concerti that in some respects gives a new look and feel to the works, the piano clean and effortless, with a kind of Olympian purity, muscular without sounding forced, powerful without being percussive. Accompanied by the Czech National Symphony cconducted by Heiko Mathias Förster, this is a confident account of Rachmaninov, lyrical and passionate. I understand Goodyear has recorded the Grieg & 1st Tchaikovsky concerti as well, which I will have to check out next.